Preheat oven to 180°C/350°F and grease springform pan with coconut oil. For the crust, pulse oats in a food processor to a fine flour. Add buckwheat flour, coconut oil, maple syrup, some cinnamon, baking powder, and a pinch of salt, and pulse to form a crust. If the mixture is too dry, carefully add water a tbsp. at a time to make the crust moldable. Use hands to press two-thirds of the dough evenly into springform pan along the base and border. Lightly flour work surface and remaining dough. Roll out, using a rolling pin. Use a cookie cutter to cut out decorative shapes, or roll out dough into a round the size of the pan, if you prefer. For the filling, peel and quarter apples. Remove core and slice. 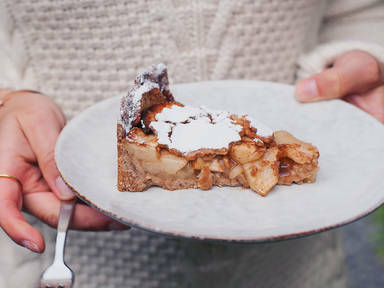 In a large bowl, thoroughly mix apple slices, some cinnamon, nutmeg, lemon juice, agave syrup, arrowroot flour, coconut sugar, speculaas spice, and salt. Transfer filling to prepared springform pan and spread evenly. Cover filling with either with cookie cut-outs or a round of dough. For the latter, pierce top with a fork to allow steam to escape while baking. Place in preheated oven and bake at 180°C/350°F for approx. 30 min. Cover with aluminum foil and press down lightly so that the apple juice rises to the top and soaks the entire cake. Bake for approx. 45 – 60 min. more, until golden brown. Allow to cool completely on a cooling rack before cutting. Enjoy!